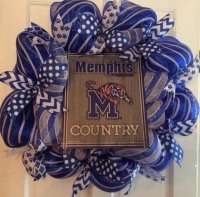 University of Memphis Go Tigers Go wreath is a great gift for any Memphis fan. 2016 will prove to be a great Football and basketball season. 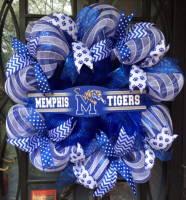 Show your Memphis Tigers support and purchase a wreath. Plus, this is a great gift for the die hard Memphis Tigers Fan. 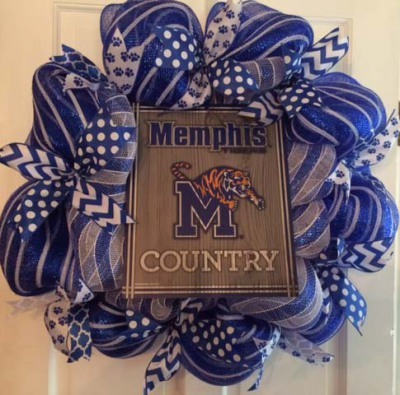 The beautiful royal blue and white really stand out and the tiger printed ribbon adds just the right Tiger Spirit. Many of my wreaths are made to order unless otherwise stated in the description/title. Some materials may vary slightly from the ones pictured based on availability, but rest assured your decorative wreath will be just as beautiful as the one here! Please feel free to email me with any questions you may have. Double Door Wreaths- I can make matching double door wreaths for almost all of my designs. Please message me with any questions. Note: To preserve quality of wreaths, we recommend that you keep wreaths under a covered area or bring indoors during inclement weather. Precipitation and direct Sunlight can alter the condition of the wreath.